Grid VFX used Golaem to deliver epic battle shots in Redbad, a Dutch movie depicting the power struggles and wars between the Frisian Redbad and his sworn enemy Pepin of Herstal, Lord of the Franks. VFX Supervisor, Laurens Bekaert, gave us some hints about how their work and workflow. Can you present yourself and the Grid VFX? Grid started in 1995 in Ghent (Belgium) as a post production service provider and concentrated mostly on commercials. Now as a part of the Tinker group it is more than that. Grid still is a post production provider for feature films and commercials for local and international clients, but the company also works as an animation series and feature film producer developing it's own IP as well as co producing projects. The group consists of different studios across Europe and is, next to it's classic post production services, becoming a well known brand of high quality family entertainment. This mix of animation and live action means we have a lot of cross pollination between people on a creative and technical level which allows us to develop our talented people as well as our productions. What was the size of your team and how long have you worked on this project? The team was about 25 people at its peak, post production ran over a period of just over 4 months. How many shots have you done in total? How many shots in total are using Golaem? The show had around 780 shots of which 30 had Golaem crowds. We also had a lot of shots that had crowd duplication done in composite using plates to keep the workload and cost of the show to a minimum. How many characters in the shots (smallest/biggest amount of characters in a shot)? We ended up adding Golaem agents even if shots only had 2 or 3 agents since we had the system set up and ready to go it was as easy as just animating them by hand. 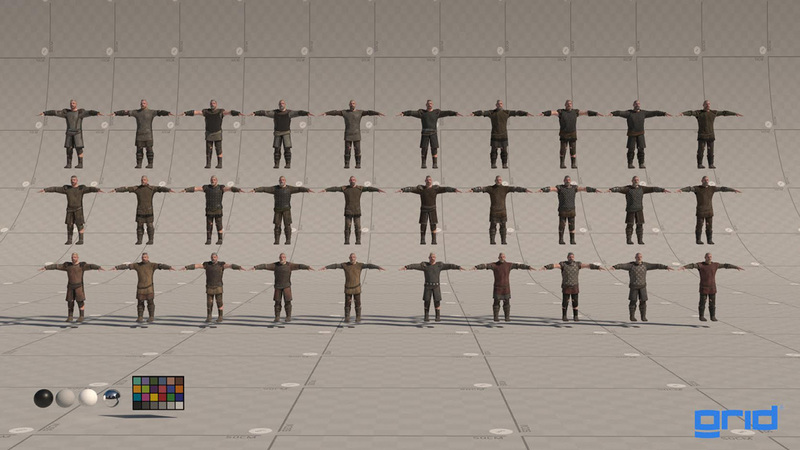 We added as little as 2 or 3 agents to boats as well as populating full CG cities that had over 5000 characters, with variation in weapons, clothing, flags etc. We also used it to scatter small groups of horsemen for which we added custom mocap to the library to match the trot of the real horses. Our agent library consisted out of 2 population groups, the Frisians (similar to vikings) and the Franks (more like classic knights). Both had a lot of variations and a regiment of horsemen. Could you give a bit of details about the challenges or features used in each sequence? We had to create 2 full CG cities that had to feel bigger than life and populate them of course, meaning A LOT of agents. Besides that the movie contains 4 different battle scenes and all of them had it's own distinctive strategy. One has a landing of Svear (swedish vikings) at the Danish coast, so we had agents on boats, running trough water sims trying to get to the beach. Another one is a complex chase scene trough 'wad territory' in Frisia, Holland, in which we had to explain how the low tides make it possible to cross the ocean, but if you do not understand this specific area you can get caught of guard and drown. For this we had to create horsemen that rode formations and match the walk cycles to the existing horses that were shot during plate photography. The penultimate battle is a more classical one in which 2 armies are across one another on the battlefield. For this one the director initially planned to create an inedible 5 minute one shot that showed the complete battle in an unconventional way. Rain however made the terrain impossible to work on, luckily they shot the rehearsal day and we ended up using that as a base for the edit and Golaem was instrumental in augmenting the scene by adding crowds in the background. In the final battle we had burning pigs running around setting the whole village on fire. Could you explain us if/how you used the Layout Tool? You mean the magic Tool? The Layout Tool was used in almost all of the shots. Although you have a ton of possibilities to limit your crowd for walking in certain areas, having that extra possibility of tweaking them in the end gives you so much more freedom. Also for the main big town, we simulated the crowds over the complete town all at once and then later on using the Layout Tool we deleted the crowds for the parts that were not visible for the camera. Is there a part of the projects you are most proud of or that prevented you from sleeping? In terms of sleepless, nights we knew the team could handle everything although they had to bring their A game. A big challenge was to get to know Golaem during the project. Since the production had already started and nobody had worked with Golaem before (we had our inhouse tool and chose not to update it but go for a new tool, Golaem) most of it was learning on the spot which turned out to be really intuitive and it did not let us down. Because of the size of the sets during shoot we could not plan on how to shoot the plates or have a clean plate at the end. This is the movie with the most extra's ever shot in Holland, so in post we had to roll with it and see what the best approach for each shot would be. The key here was to spend every cent as efficient as possible so we could meet the directors needs story wise. Besides that, director Roel Reine always has some challenging idea on how to approach and enhance the storytelling of his movies, and we have to try to fill those expectations to the maximum. An interesting side note is that we used Maya to simulate the crowds but 3DS Max and Vray to render everything.